At this same time three years ago I can remember eagerly following the events of World Youth Day, which was taking place in Sydney, Australia. I was unable to attend in person, but I remained glued to the television, taking in all of the exciting festivities that were occurring during that week-long celebration of faith. 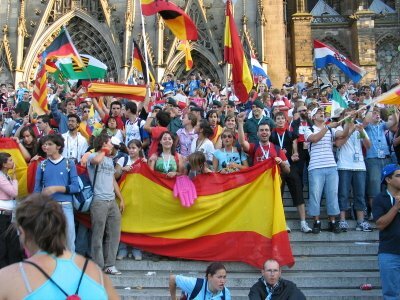 Since 2005, when the event was held in Cologne, Germany (and I began to feel intensely drawn to Catholicism), I had fostered the desire to attend a celebration of World Youth Day at some date in the future. Witnessing so many young people who were excited, driven, and vibrant about their faith in Christ was wonderfully inspiring to me. Throughout my life my faith has always been an abiding mainstay. Yet, even if America technically remains a Christian nation, most people of my generation either practice their faith nominally or are indifferent towards it. As I grew in my understandings of the world around me, I came to view this reality less from a judgmental standpoint and more from one of discouragement. I knew what a great source of empowerment and joy my own faith was, and it saddened me to know that other people my age didn’t really seem interested in cultivating such an aspect in their lives. From what I saw, the people who were in my age category at my parish did not participate in the life of the church voluntarily – because they enjoyed and felt fulfilled by it – but rather, because they had been prodded into these activities by their parents or other family members. Consequently, I never really felt that I could share the intensity I had for my Catholic faith with most other people my age without seeming odd or unusual. This is why the entire premise behind World Youth Day resonated so profoundly with me. The opportunity to travel to another country and to gather in fellowship with other Catholics who shared my love of the church and ardent faith in Jesus Christ I knew would be a powerful respite that would spur me to remain steadfast and confident in sharing the light of the Gospel with others. Also, the chance to meet other like-minded Catholics with whom I could forge new friendships was an uplifting prospect. To coincide with 2008’s World Youth Day, the Vatican attempted to tap into the buzz that had surrounded social networking sites like Facebook and Myspace and created their own networking tool called Xt3, which was designed to connect pilgrims before or after they had attended World Youth Day in Sydney. I eagerly signed on to this effort, anxious to meet other Catholics from around the world who shared the same vivacity about their faith that I did. For awhile I stayed connected to this initiative and saw it as a way of getting more closely involved with those who might be attending World Youth Day in the future. But I began to notice something startling. At this point in my life, I was just beginning to define my identity in terms of my sexuality as well as my political beliefs. As I began sharing this process of exploration with those whom I had befriended online I noticed that many people did not have a very open-minded attitude when presented with these topics. Eventually, certain people began to take it upon themselves to denounce me as a heretic, warning me that I was consigning myself to eternal damnation for holding such opinions. As I gradually moved to a new position of enlightenment and stability in my faith I began to see this online forum as less and less relevant to my personal growth and edification. I’m happy to say that I have maintained contact with several people whom I met through this website who have continued to remained supportive of me since I came out and learned to see my faith in a new, more objective light. But as a whole, the website no longer serves any substantive purpose in my life. Sadly, the very same conclusion can be reached concerning World Youth Day today. How productive is this gathering if those who participate are not allowed to bring all of the experiences, perspectives, and unique insights that form the foundations of what it means to be a youth in todays’ world? Would this not be the avenue par excellence to enter into dialogue on a variety of topics that the church’s youth could offer a refreshing and compelling take on? For example, why not establish opportunities during the course of the festivities where designated sessions of conversation might be able to take place concerning such issues? The institutional church would like to give the impression that this is precisely what occurs during World Youth Day. However, the question and answer sessions that usually take place over the course of the week are usually very contrived with the questions being screened and picked beforehand. As far as the responses from those who conduct these venues go, they are always exhortations to follow the Catechism and ecclesiastical doctrines to the most minute letter of the law. In a sense, all of this could be viewed as a subtle form of brainwashing. Perhaps this is why, when I began to expound and become confident in new ideas, others on Xt3 were so quick to respond in a discouraging and condescending manner. If the youth of today’s church aren’t allowed to embrace an adult approach to their faith how can the universal Church ever grow and make a meaningful impact on society if it is composed of children relying on their eccelsiastical parents for the answers to life’s questions? Despite such inertia, a glimmer of hope can be found. Our fellow 20/30 members Nicole Sotelo and Emily Jendzejec attended last month’s most recent celebration of World Youth Day in Madrid, Spain as official ambassadors of Call to Action, spreading the message of reform and renewal throughout their stay. One day, they took the opportunity to promote the dignity of LGBT youth within the church by offering rainbow ribbons to passersby in an effort to build solidarity for this cause. Although Pope Benedict, nor any of the prelates gathered there would have never even contemplated such a gesture, many pilgrims responded positively, pinning the rainbow ribbons to their shirts. A young Spanish priest even commended Nicole and Emily for their presence at World Youth Day – a remarkable sign indeed!